HAND-BUILT – Each piece of solid, natural wood is hand-crafted to preserve its rustic beauty and charm. PURE – Medical Grade #304 demagnetized Surgical Stainless Steel Housing for the Infrared Heaters are enclosed in a natural cabinet of real wood, with no toxins, chemicals or other harmful products used. ULTIMATE – The Muskoka and Muskoka XL models feature a unique round or oval shape, allowing for the ultimate detoxification. They also feature the “medical therapy seat” to target enhanced detoxification in the lower back and hip area. NO HARMFUL EMF’S – EMF’s (Electro Magnetic Fields) cannot be seen, touched, or felt, but they are harmful to our health. While every electrical device has some EMF’s, our Custom Saunas have no harmful levels of EMF's, making them one of the few Saunas that are truly safe and healthy to use. 96% FAR INFRARED – Our Saunas feature the “tried and true” solid clay stone ceramic rock heaters that emit 96% Far Infrared Light, which is the industry best. Top that off with the natural wood and you get the best possible infrared experience. 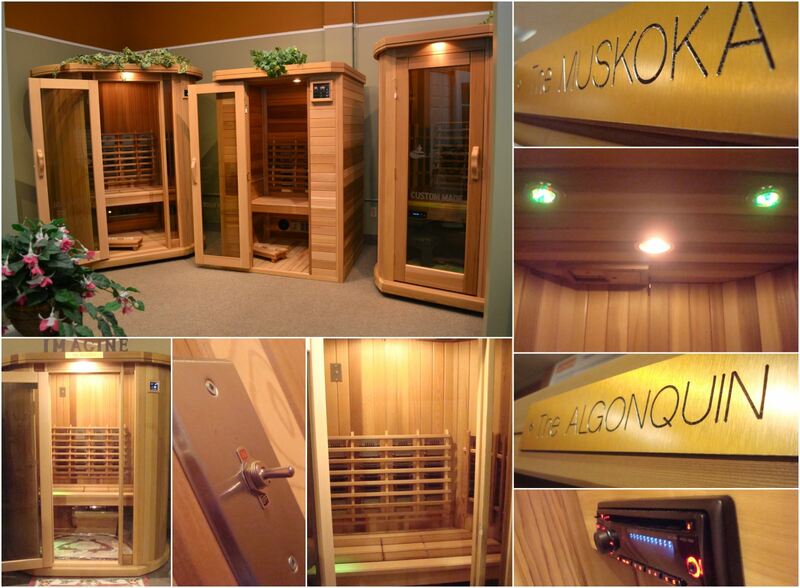 EXCELLENT WARRANTY – Our Custom Saunas are designed for the long run with a 25 Year Heater Warranty and solid wood, that won’t develop mold or deteriorate. They are also certified by CSA (Canadian Standards Association) to the strictest standards in the industry. GOES ANYWHERE – Assembles in approximately 30 minutes and comes apart in about 30 minutes. Some of our Sauna models plug into a regular 15 amp wall outlet. (Ask us for electrical details for your custom model). Unique design and simple assembly allows you to put your new Sauna virtually anywhere, with no plumbing or special wiring required. 3 THERAPIES IN 1 - Experience the amazing benefits of natural infrared heat, natural infrared light and cellular detox all in one product!